Kids love Easter coloring pages, and there are several Easter coloring page printables online. The problem is, however, that most are about bunnies or eggs. Do you know how hard it is to find Christian Easter coloring pages or Christian Easter activities? Geez! That’s why I created these 8 wonderful Story of Easter coloring pages! Each Easter coloring page printable contains a powerful truth about Easter and an Easter Bible verse so that your kids can learn about the true story of Easter–the Resurrection–while they color. Easter coloring pages are such an easy Easter activity that shares the true Easter story about Jesus’ Resurrection with kids! Check out these Easter colouring pages below! P.S. These Christian Easter coloring pages as part of the Christ-Centered Easter Family Resources here. Download them (and other Easter activities for kids) here. How Can These Easter Coloring Pages Help My Kids Learn About Easter? Each year, Easter is a wonderful reminder for all of us to rediscover the power of the Resurrection, and what better way to teach young kids the story of Easter than with Easter Bible coloring pages? 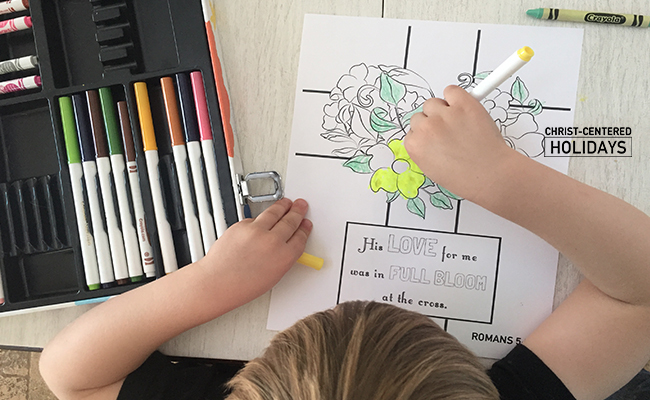 Children really enjoy coloring, and parents can use the Easter Bible verses on these Easter colouring pages to tell the Easter story in a casual, informal way. It’s a great Easter activity or Easter craft for kids that shares about the Resurrection! 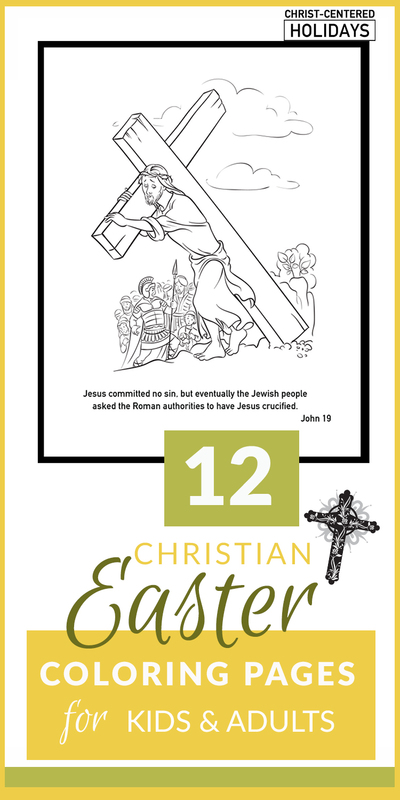 Learn more about the Story of Easter Coloring Pages here as part of the Christ Centered Easter Family Resources. What Do the Story of Easter Coloring Pages Look Like? Each of the eight (8.5 x 11 inch) Story of Easter pages use Bible verses from the Gospels to tell a little bit of the Easter story at a time, from Jesus’ baptism to some of his miracles and His eventual death and resurrection. 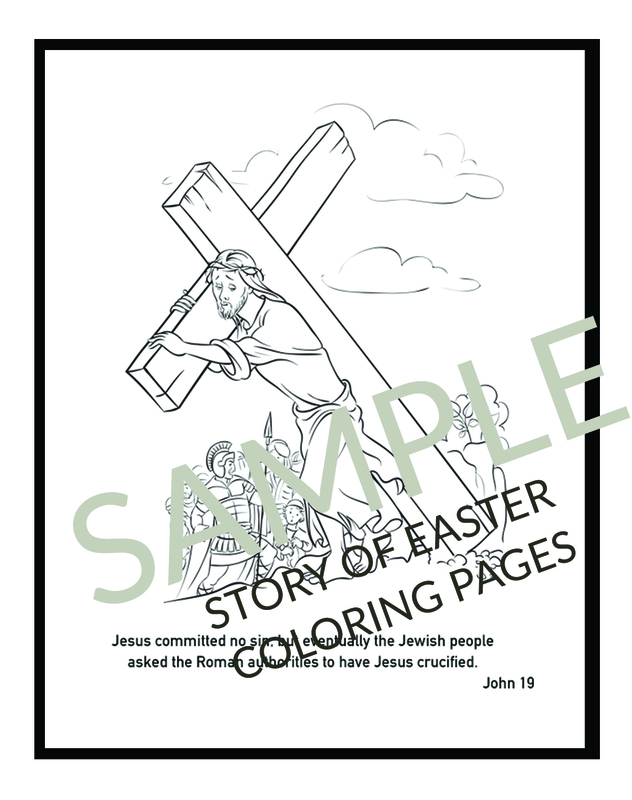 Download your Story of Easter Coloring Pages here as part of the Christ Centered Easter Family Resources. 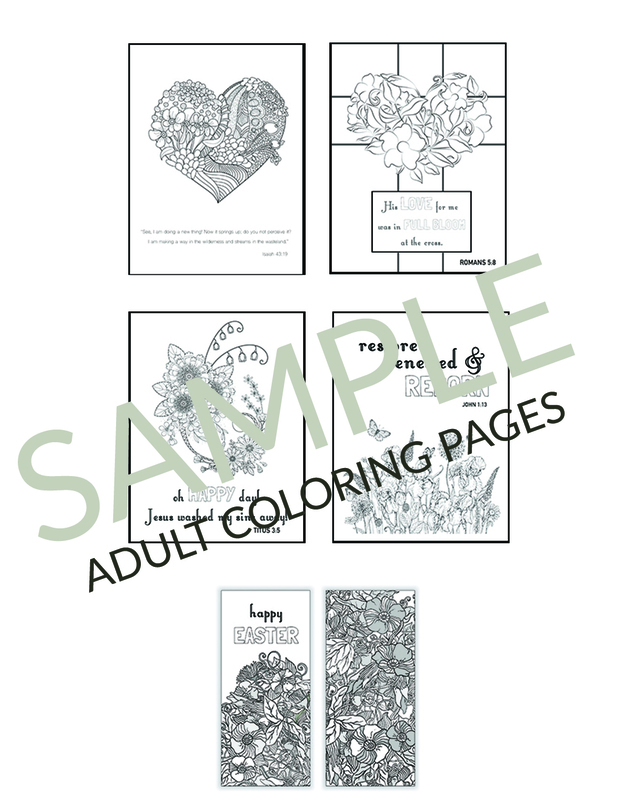 You can get these awesome Easter coloring pages as part of other Easter activities for kids, or with an Easter Bible study! Are These Easter Coloring Pages for Adults Too? I love coloring with my kids, and adult coloring is all the rage. So the answer is, sure, you could color the Story of Easter Coloring Pages with your kids. 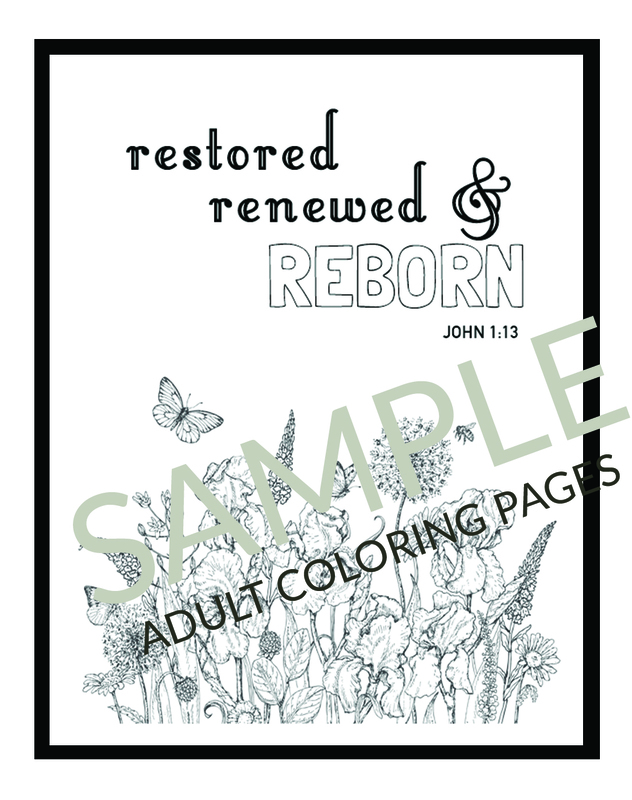 Or, if you’d like, check out these Easter Adult Coloring Pages (also a part of the Christ Centered Easter Family Resources). These 4 adult Easter coloring pages are a bit more intricate and focus on the spiritual gifts behind Easter. These Easter colouring pages also include an Easter bookmark to color (front and back)! 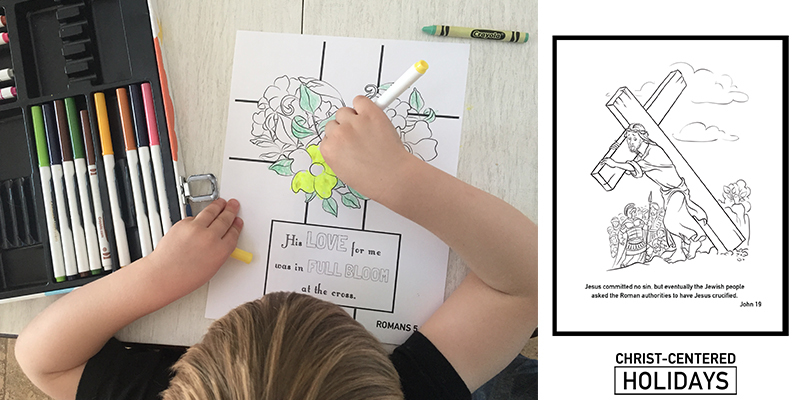 The point is that these Easter coloring pages are a great way to have meaningful conversations with kids about the Resurrection and what Jesus’ sacrifice means to us. Download both set of Easter Coloring Pages here as part of the Christ Centered Easter Family Resources. As mentioned above, the Story of Easter Coloring Pages and the Adult Easter Coloring Pages are only one fun Easter activity in the Christ Centered Easter Family Resources! The Christ Centered Easter Family Resources also include Easter Bible studies, Easter crafts and other ways to discover the true meaning of Easter as a family. 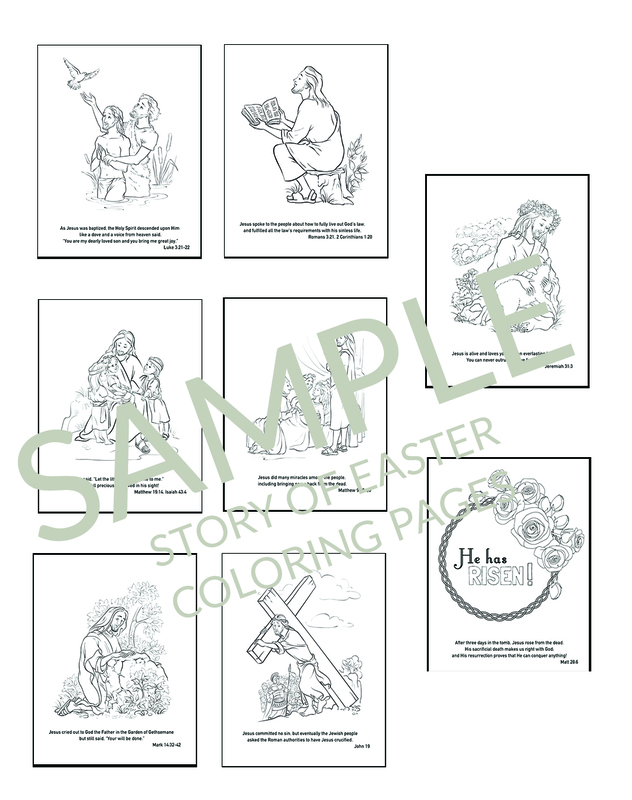 Purchase these Story of Easter Coloring Pages and the Adult Easter Coloring Pages as part of a set of Christian Easter activities (including a Resurrection Tree activity, Scripture Bible Verse Cards, Easter Coloring pages and more) or purchase them with one of two Easter Bible study printables. Either option is available with the Christ Centered Easter Family Resources! Choose just the Christian Easter coloring pages and other Christian Easter activities that your family needs here.